On September 5, 2017, Google Chrome 61 was released and it removed Pocket's Trending Stories from the default new tab page. Pocket built this extension so we can continue sharing these stories whenever you open a new tab, and to pave the way for future new tab functionality. Please be sure to add the Pocket New Tab extension to Chrome today so you don’t miss out! 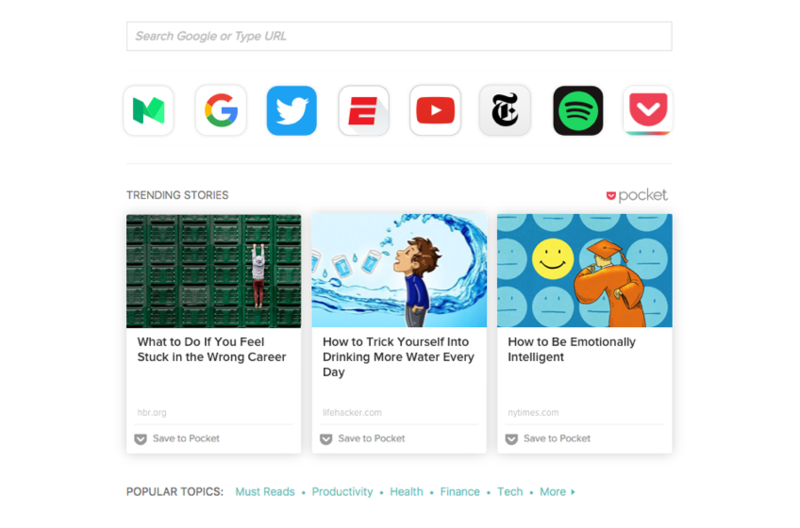 The Pocket New Tab Extension is a great way to keep up with Trending Stories from Pocket whenever you open a new tab in Chrome. These stories are updated throughout the day so there’s always something interesting to read now, or save to Pocket for later. Just like the default new tab experience in Chrome, you’ll be able to search the web, get quick access to your bookmarks bar,and see a list of your most visited sites so you can always jump back to them with minimal effort. You might already be familiar with Trending Stories on your default New Tab page in Chrome. We’ve moved them to this new extension to make sure that you can continue to enjoy them after some upcoming changes to Chrome. Click here to download Pocket New Tab in the Chrome Web Store. Pocket New Tab is customizable to meet your needs whenever you open a new tab. With the exception of Trending Stories (which are always shown), there are a few other elements which can be enabled or disabled. Dark Theme: Invert the colors of your new tab with light text on a dark background. Bookmarks Bar: See your Bookmarks Bar at the top of every new tab for quick access. Search Bar: Perform a Google search or navigate to a URL directly. Trending Stories from Pocket: Trending Stories are curated by over 25 million people who use Pocket to save and discover stories that are meaningful and worth their time. To customize your New Tab, simply move your mouse to the gear button at the top right corner and make your selection. We understand that allowing Pocket New Tab to access your browser information may sound concerning. Therefore, we'd like to take a moment to explain how we use, and don't use, this information. 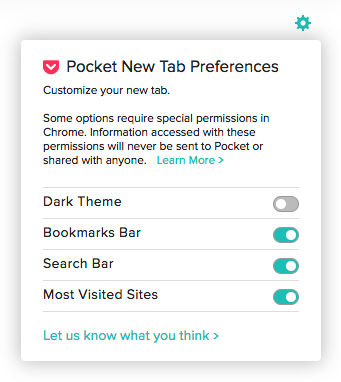 When you enable Most Visited Sites, Pocket New Tab will request permission to access your frequently visited sites in your browser. It does this in order to display the Most Visited Sites section in your New Tab. Performing Searches in Pocket New tab will either perform a Google search, or visit a site directly if you enter a URL. Information about your bookmarks, frequently visited websites, or searches you perform is not tracked by this extension, and not sent to Pocket or shared with anyone. I installed Pocket New Tab but it doesn’t appear when I open a new browser tab. What’s wrong? If you see something else when opening a new tab, it’s possible that you have more than one “new tab override” extension. You can only have one active override extension, so if you have more than one, please disable the others by unchecking them in your Chrome Extensions page (Window > Extensions). Why am I seeing two Pocket buttons in my Chrome Toolbar? Every Chrome extension gets their own toolbar button, even if it’s not utilized. If you’d like to keep your Chrome Toolbar clean and not include the Pocket New Tab button, simply click it and select “Hide in Chrome Menu”. When managing your Chrome toolbar buttons, be sure to keep your Save to Pocket extension installed so you can continue to save pages to Pocket in one click!